Some three or four years ago I had a project guitar called "Sabre" with Sustainiac system in its heart. It was Jackson DK2S basically, I had the guitar equipped with Jackson DXMG neck, Gotoh floyd, Charvel tuners, Dimarzio Evo pickups, redid the finish (done by Krišjānis Kupcāns, kkdrums.wordpress.com who also made cajon for me). Played for some time but it just didn't feel right for me, very clumsy neck being probably the weakest point. Even with the Dimarzio Evo in the bridge it sounded very dark. For some strange reason, which until this day remains unresolved to myself, I sold the guitar. But at least the guitar is owned by my good buddy and excellent guitar player Viesturs Donis. After the "Sabre" the next project I had was "Nano", Ibanez RG series with Bill Lawrence L500XL and Seymour Duncan '59 SH-1N pickups, push-pull wiring for single coil sound variety, removed the tone knob from the circuit for even more brightness, Gotoh floyd (not on the picture though), tremol-no (also added later; I had the Edge III blocked with wooden block initially),and also redid the finish with beautiful golden madrone veneer (again, done by Krišjānis Kupcāns). 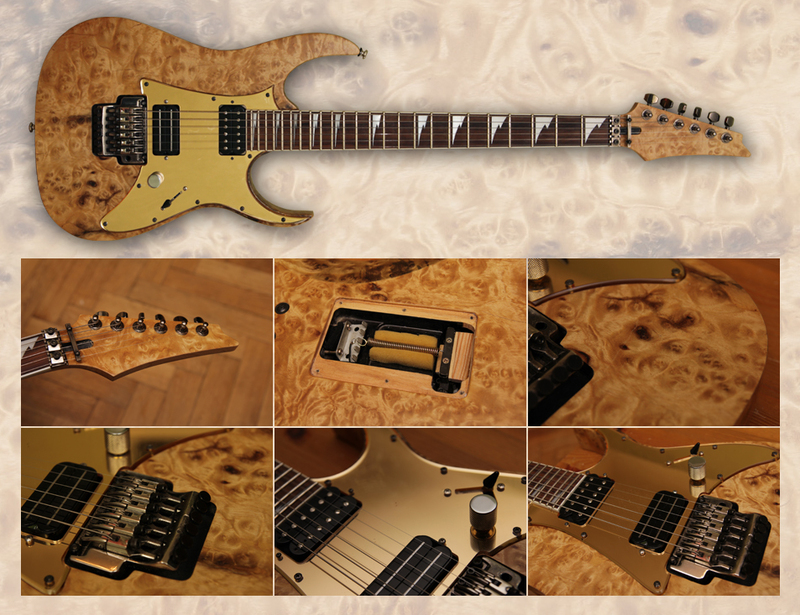 And this guitar just feels so natural to me that now I've decided that I want to do a new sustainiac guitar project but this time preferrably with Ibanez RG playability and comfort. 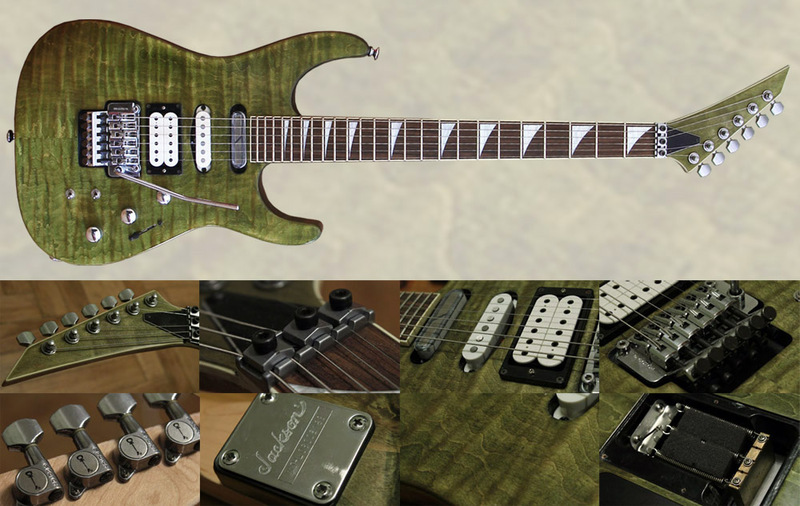 So I am now setting a new objective for the new sustainiac guitar and have some specs. I will update the blog as the project progresses with the pictures and such. Has to have on/off switch, natural/harmonic/mixed switch and intensity control. The simplier versions of sustainer system do not interest me, because I think the added controls give the ability to somewhat humanize the sustainer's trademark stamp on the sound. Since the Sustainiac comes in a single-coil shape, an adapter ring will be necessary to mount it into humbucker hole. 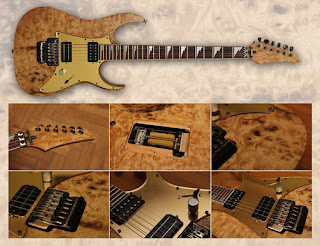 I will probably want to go for Ibanez RG350 series with the pickguard. I have used Dimarzio Evolution, Evo 2, Bill Lawrence L500XL, Seymour Duncan '59 SH-1N, Dimarzio YJM pickups on my previous guitars. I am thinking of a little crunchier version of Evo. What would that be ? Currently I am thinking HxH configuration pickguard with Dimarzio Steve's Special in the bridge position and Seymour Duncan Little '59 besides sustainiac pickup in the neck position. Gotoh GE1996T all the way. Love gotohs for their stability and tremolo arm attachment. I have Edge Pro on some other guitar and I think its tuning stability is tiny 1/1000 ahead of Gotoh 1996, but the trem arm attachment and absence of the torque is probably more important to me. Also, for this Gotoh, I might want to add bigger brass sustain block from www.fu-tone.com because it really makes a difference on the general sustain. Additionally, it's harder to install Tremol-no (see below) on an Edge Pro because of the shape of its sustain block. And, I find that the hardware colour (material) has an impact on sound (blacks are darker, chrome are bright and golden being something inbetween), so I’d go for the golden one this time, as it should also look fine with finish woods which I have in mind. What can I say ? I want this guitar in standard E tuning this time, but also to add a possibility to use drop-D or simply the hardtail mode. Tremol-no is a superb tool for just that, have it on my other guitars. Ibanez RGs are usually basswood bodies and that's exactly what I like about them, mahogany is probably too heavy for me and I don't like that is has a mahogany stamp on the sound, I wish to go less-paulish. The guitar will be refinished with decorative veneers intarsija.lv/en/25-veneer-of-knots. I am thinking mahogany veneer (yes, irony here) on the back and sides, poplar or maple birds eye on the front, red-ish matching pickguard. And of course a matching headstock.